Another Dabawenya has had enough of the mudslinging against Duterte and want to say her piece. She believed she knew where she speaks of, being a long time neighbor of the Mayor of Davao City. On top of that, she is a former Production Officer of ABS-CBN and correspondent of Bantay Bata Foundation. It can be recalled that Mayor Rodrigo Duterte went under fire from critics and supporters from the rival camps after he cursed the Pope while telling an anecdote in the middle of his acceptance speech as the Presidential bet of the PDP-Laban. Realizing the magnitude of his faux pas, Mayor Rodrigo Duterte quickly owned up his mistake. He clarified in front of the TV camera that he did not direct his cursing towards Pope Francis but, rather towards the government that mishandled traffic management considering the visitor was no less than the Pope. I was born in the year 1978 in Davao City and lived just meters away from his home in Bangkal. As a kid, I would hear stories about his generosity, but it was not until I was already around 28 years old that I had personally witnessed how genuine this man really is. I had the privilege to work as a Production Officer for ABS-CBN Foundation, Inc. and a correspondent for Bantay Bata 163 Davao. My partner, Simeon Jr Celi, and I would produce a material that usually featured an ailing child either needed an immediate operation or an expensive medical treatment. Through local TV Patrol Davao in the afternoon, the said feature stories were aired for broadcast. Walay broadcast, walay pa-picture, purong tabang lang alang sa gakinahanglan. Mind you, dili nako maihap pila ka bata iyang natabangan ug dili requirement nga botante ang mga ginikanan sa bata. Wala siyay labot maskin taga Tagum, Mati, GenSan or Cotabato, basta nakatabang siya. (No broadcast, no photo-ops, but all he does is help the needy. My respect and my vote goes to my Mayor, to Mayor Digong! People should share this to the broadest possible audience. The man is extraordinary. I salute the man as human with a big heart. We should support Mayor DU30 to lead our beloved country. No one among the presidential candidates deserves it. oo tama ka. dapat talaga para malaman ng ibang tao na ginagawa ni duterte kaysa sinisira siya ng kalaban. Worth to be the next president. Hear our prayer, Lord! Mayor himself dont like popularity by publicity.helping needy people doesnt need TV,radio or any form of media,it just only need a “heart” which Digong possesses. I still believe the candidacy of mayor Duterte even from negative feedback of his opponents. Go go mayor SA pagbabago ng Pilipinas. With all our support from OFW HongKong. I fervently pray that Mayor Duterte be our next President of our beloved nation, Father God in Jesus mighty name…amen! This campaign to destroy is a battle being waged by a candidate with the active support of media, mainly the biggest 3 in broadcasting. These outfits have long been in cahoots with this administration and are supporting the “daang matuwad” tandem. They are afraid, the owners of these companies, because they might lose influence hence their business interests can no longer be protected. Just observe their political commentaries and their biased reporting on the campaign sorties of the different candidates. Kita mo na kung sino manok nila. I am a DUTERTE fan but not a voter, although all my relatives back home are all for him. I read an article about DUTERTE being an Antisocial Narcissist but whoever the writer is doesn’t know what he’s talking about. Narcissists don’t have empathy but people say a lot of great things about this man, what he does for the sick, needy and the disadvantaged is not kind of trait someone who is an Antisocial narcissist. There is no mask here. I’d say a little arrogantly confident but narcissist NO! The Binays and the likes of Roxas, Marcoses, Aquinos , Arroyos and their cronies are the real Narcissist here they stole so much from the Filipino people without any remorse or empathy. Continuously having the same group of corrupt people to run the country is always going to be a further backward step. A competition of who can bleed the country and the people dry the most. with the Filipinos- Give him the chance. I personally appreciate the willingness, kindness and vigilant character of this leader. I was employed one time way back 2003 to 2007 at Algon Construction & Development Corp. 2006 we received work contract from his Office to repair the roads of the downtown Davao City by asphalting. Works should begin at 10 oclock P.M. due to heavy traffic flows . One time I spotted Mayor Digong with his favorite big bike chatting with my crew, later he went to the bakeshop any some pandesal with coffee for my crew. That is mayor Duterte, even late at night, he personally watch and guard his constituents , the residents of davao city . GOD Bless Mayor Duterte sure your the next president of this republic. Sir, can I share your comment? Thanks! I am on your side, to fully Support our Pres. DUTERTE. Today’s Kids & YOUTH are our country’s FUTURE. So we should protect them from drug traffickers!!! No days to waste, those drug Lords have to be stopped. This country needs a leader with principles, who cannot be bought. A man of action and serious about ending corruption and changing the system. We are praying for your safety and good health mayor duterte! Mabuhay! That’s our mayor, Mayor Rodrigo Duterte. May not be perfect, but selfless, transparent, and dedicated servant of his country. Apparently this is the reason why his campaign for presidency is volunteered, led and financed even by people who he does not know personally, but believe on his leadership. God bless your candidacy mayor. I still firmly believe Mayor Duterte is Godsend. He is a strong man with good leadership. We need a president who is brave, honest and merciful to needy poor people and the children. Mayor Digong is bound to be a leader not only in davao but entire phil…countless times he lend his hands without addressing it to the public..this man of action is truly extraordinaire!.. sa dami dami ng mga nabasa kung positive, puna at negative feedbacks kay Mayor Duterte, mukhang sya parin ang President ma iboboto ko wala ng iba. Suggestion: kailangan na siguro ni Pres. Duterte ng Security/ body guard. I am not a voter but I do believe that Duterte will be a good president. 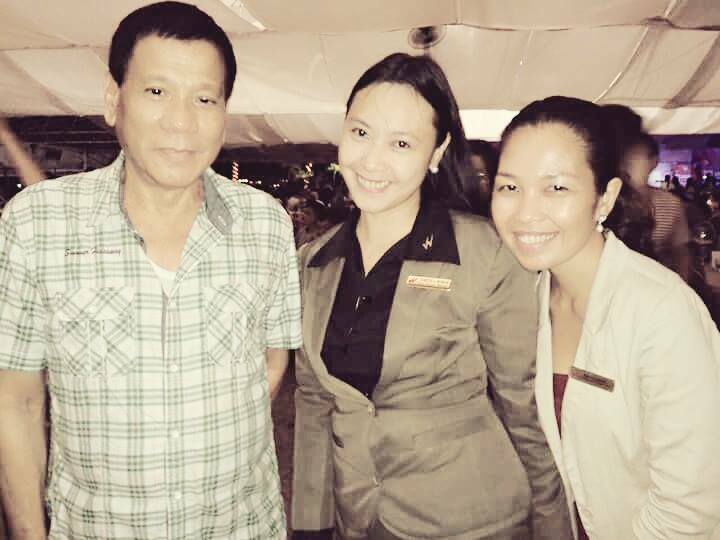 a genuine and a good leader with a heart.God bless you always Mayor Duterte. I may hate his mouth for his misplaced jokes and comments but i surely love his heart and his hands for readily extending maximum help without questions for those who are needy. I was planning to boycott this coming election but changed my mind when Duterte decided to run. Without hesitation my vote goes to him. Duterte for a renewed Philippines!! Apparently the Mayor is not afraid to expose himself with all his flaws to the people. He is what he is and I admire him for that. He is so unlike most of our sugar coated politicians. repeat Bong Osorio’s comment pls.. for me plus this one: in my 59th year in davao, i have yet to see Duterte badmouthing the least people approaching him in his office, unless grabe cguro mga kasalanan, i am not sure. basta, i have yet to see..however, when he is in public and he wants to emphasize something especially a delicate matter, he badmouths first just to be sure, everyone listens! That’s a real no matter what and where they came from as long as they need help Mayor Rody’s intentions pure and clean no political behind it’s a “HELP” and thats my PRESIDENT…. This is now the real time the Philippines will rise from a long time sleep and tell the whole world we are proud Filipino. This is where criminality will be eradicated, drugs will be banished including the drug lords, true corrupt government officials including Binay and his Family will be jailed, kotong Cops will be gone, Heinous Crime will stop and most of all true justice will be served to the oppressed. These are what we can achieve during the Presidency of Mayor Duterte. Mabuhay ang Pilipinas. Dapat share to para malaman ng mga taga Abs cbn ang pagkatao ni Durerte kay dili kabay og sapi ang imo pagtulong sa mga bata .pero dili ingnon nga sa iyang maayong gibuhat sa bayan ng Davao ?naapa diay ealay pagsalig ni Mayor ? so mag mata na gising Pilipinas kay miabot na ang atong gipaabot nga mahimong Presidente sa Pilipinas ..Bangon Mabuhay Duterte Cayetano Team paras a pagbabago! No one is perfect but to all presidential candidate only Du30 telling the truth and exposing his true character. Duterte for President. I would like to believe. However, if it was indeed true that he was that generous kindly tell du30 we nid an amount for the medication of my aunt for about 50k only. Pls reply. May the 9th be with you….Mayor/ President Duterte. We claim it n Jesus name. Amen. God Bless Ducay, God Bless the Filipino nation. I live Davao for more than 50 yrs already…..Many Mayors passed….But with Mayor Duterte ,i truly experienced a quick action.Once ,sometime in a year 2008.We had a Videoke corner at Torres St.We made a 911 call for assistance because there’s a group of drunk costumer who mess up our place and also in that group 1 policeman harrassed one of my girl.With that call in 10 minutes,he showed up [Mayor Duterte] with his sting ray’s tail quickly whip the group away to our place.So thankful indeed. President Duterte really meant what he promised and is doing what he supposed to do. Excellent! Good for the Philippines. Finally found someone next to Marcos Sr. He is One of a kind President.More people love him,and i am one of them.He has a clean heart,clean mind and clean conscience.God Bless you our Dearest President Duterte. wow what an amazing brave woman. Kudos and I salute your fairness. we salute you brave woman. Thank you for sharing your experiences while you were in ABS-CBN premise. To our new Pres. Digong he really is a great man with a big heart.